Standard bonding machine pattern recognition vision systems (auto correlation based) today determine their location based on a “pixel to pixel” matching system. 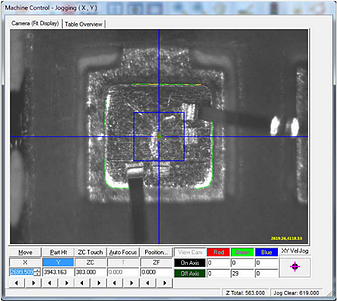 Standard bonding vision systems look for similarities based on the pixel grid of the part as seen through the camera. The standard software uses that pixel-to-pixel matching to reference the part. The limitations of the standard software is that it is very sensitive to changes in light, differences in coloration of parts, and especially inefficient when dealing with poor materials (which can be caused by different chips from different suppliers, or variations in chip fabrication). These limitations prevent the bonder from “capturing” the part reference when it does the bonding. When part capture fails, this requires the operator to manually reference the part. The operator must look through the vision display window and one-by-one manually reference the part. When the operator has to manually reference, the process becomes extremely tedious, time consuming, less accurate, and gives away some of the automation power of the machine. Also, the customer often has to throw away parts that are too difficult to see, reducing the yield of the bonder and increasing the cost of building the part. If all parts were perfect, the standard vision system would be sufficient every time. However, all parts are not perfect and variations are to be expected. 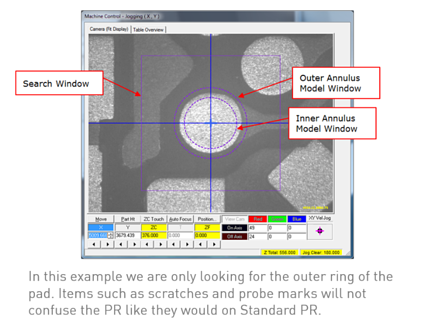 Standard bonding machine pattern recognition cannot see shapes and does not understand shapes. It also cannot see objects without borders. So how should a bonding machine solve this problem? We asked the question: what if the bonder could work like the human eye? What if the bonder could automatically operate like the human eye and learn shapes like the human brain? So we implemented a pattern recognition software that mimics the human eye and brain, as well as tailored the features and user interactions specifically for wire bonding. 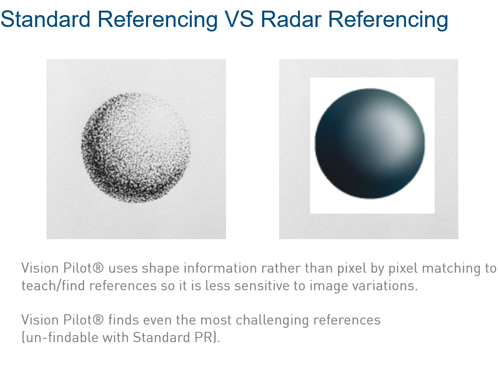 This software is called VisionPilot® with Radar Referencing®. The image on the right shows how the human brain works when looking for references; it sees shapes, not a pixel grid; seeing shapes and patterns is much more efficient. The human eye is very efficient in learning patterns and then recognizing those patterns, regardless of minor variations; the human brain has greater tolerance for variation and can see the bigger picture of the what and how work must be done to build an object. VisionPilot is Palomar’s first introduction of artificial intelligence to wire bonding. VisionPilot uses synthetic models and active feedback showing where the real part matches the model (green) and yellow and red where it does not. Because the human eye is more efficient in referencing parts (more efficient in seeing fiducials that are hard to see using a standard machine software, seeing the common pattern regardless of variations in part quality and not being so sensitive to changes in light), it would be best to have a software work like the human eye and process it like the human brain. Like the human eye, VisionPilot learns references (fiducial references, or other part references) by looking for similar shapes. The bonder “learns” the shape and always looks for similarities in shapes. In doing so, the “capture” rate goes up dramatically. Savings on process development and training costs because the machine carries the workload.